As acupuncture gains popularity here in the West, more medical practitioners like medical doctors, physiotherapists and naturopaths are incorporating it's use into their own practices. While it's truly wonderful that the benefits of acupuncture are being realized, it has unfortunately created confusion amongst the public about the practice of acupuncture, and who to see, when multiple health practitioners are (seemingly) using the same tool. Here are the facts. The amount of training for health care practitioners using acupuncture in their practices other than a fully trained TCM, is quite limited. In some cases, due to such limited training, therapists are not encouraged to call their learned needling style "acupuncture" as it is not reflective of the theories, concepts or practices of acupuncture (Functional or Dry Needling & IMS as examples). A registered TCM Acupuncturist (R.Ac) has a minimum of 3 years of in-depth training in TCM medical theory and diagnosis, point location and needling techniques, as well as biomedical training in advanced anatomy and physiology. A registered TCM Practitioner (R.TCMP) and Dr.TCM has even more training, spending 4 and 5 years respectively studying more in depth theories and techniques as well as pharmacology and herbal medicine. At the highest level, a Dr.TCM studies such things as the classics, advanced techniques, theories and practices of acupuncture and herbal medicine as well as the management and treatment of 'difficult diseases' (TCM Psychology, Oncology etc). The important piece to take away from this, is that a TCM practitioner is an acupuncture 'expert'. Acupuncture plays a central role in patient treatment alongside other TCM therapies, not an additional one. Acupuncture is an intricate and complex practice that takes years to learn and master, and when performed by an adequately trained professional can provide tremendous benefit. 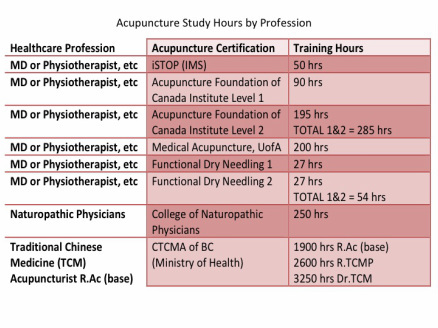 If you are unsure about how much training your health care provider has in acupuncture. Ask them. Only registered TCM practitioners may use the title "acupuncturist" as it is a reserved and protected title for use by the CTCMA as per the Health Professions Act, BC.